Aristocrat Asks the Gaming Industry: "Are You Ready for Award-Winning Cabinets..."
LAS VEGAS, NV--(Marketwire - October 12, 2010) - Are you ready to re-think everything you thought a cabinet could bring to the gaming experience? Aristocrat Technologies is (www.areyoureadyg2e2010.com). For the past year, Aristocrat has been building for the future, and now the company is building momentum. In booth #1210 at the upcoming Global Gaming Expo, Aristocrat will be showing three innovative new cabinets, including the artfully-designed and award-winning VERVE hd™, the large-screen sensation VIRIDIAN™ WS and the slim and ergonomic Vii™ Slant. "This is absolutely the most exciting G2E lineup Aristocrat has had in 10 years. Attendees will clearly and quickly see that this is a year for genuine forward thinking that delivers real results," said Aristocrat President Nick Khin. "I have no doubt that after taking just one glance at VERVE hd, VIRIDIAN WS and Vii, attendees will be impressed with the overall design, presentation and use of leading edge technology such as our new full color Nteractive™ LCD buttons." 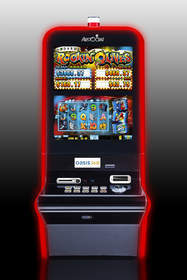 In addition to VERVE hd, VIRIDIAN WS and Vii, at G2E 2010 Aristocrat will be revealing new math models, new and innovative game play, more than 230 games, and exciting new modules for the Oasis 360™ system. Aristocrat Technologies Inc. is a subsidiary of Aristocrat Leisure Limited (ASX: ALL), a leading global provider of gaming solutions. The Company is licensed by more than 200 regulators and its products and services are available in more than 90 countries around the world. Aristocrat offers a diverse range of products and services including electronic gaming machines, interactive video terminal systems and casino management systems. For further information visit the company's website at www.aristocratgaming.com.